It’s the most wonderful time of year when we’re all preoccupied with friends, family, food and frolic. Thanksgiving ushers in a feeling of gratefulness and reflection, as we race toward the conclusion of another year. We here at Too Thrifty Chicks will take the time to savor these fleeting moments and hope you’ll do the same. Take time during the hustle and bustle of the season to slow down, breathe, turn inward and reflect. Make space for joy that can’t be bought. And while you’re reflecting, take time to think a little bit about the nifty, thrifty looks that you can pull off this holiday season. And don’t forget to look for a post about ideas for gifting thrifted items. Check out what Reese and Ricks wore to a conservative gathering and a more casual affair. Enjoy! Getting ready for thanksgiving dinner. Needed to wear something comfortable and casual that would be acceptable for a more traditional setting. 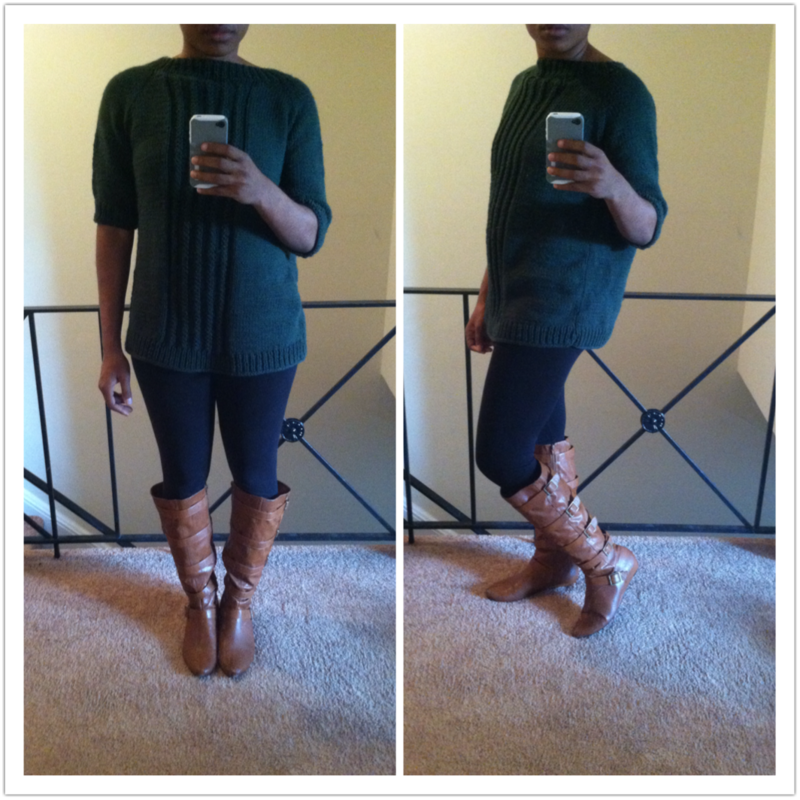 Love love love this green sweater I found at B-thrifty. I’m pretty sure it’s handmade. Attended church service with my partner’s family. The church is on the conservative end, so I needed to dress appropriately for the venue without looking drab. 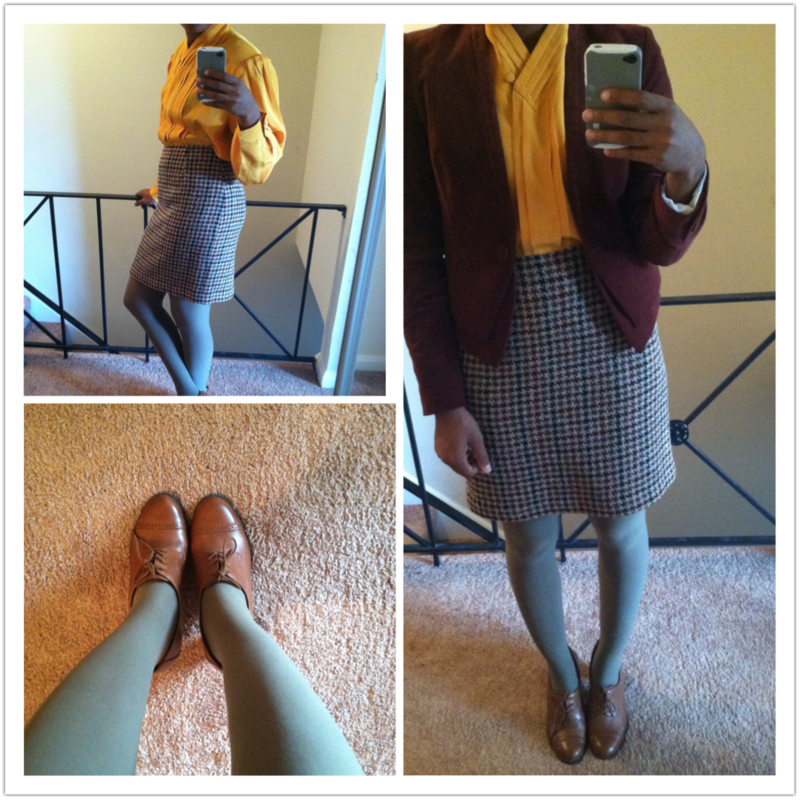 Paired a gold shirt with a classic skirt (both thrifted), olive green tights, oxford heels, and a corduroy jacket. A casual ensemble that travels well while riding in a car and effectively hides a food baby. 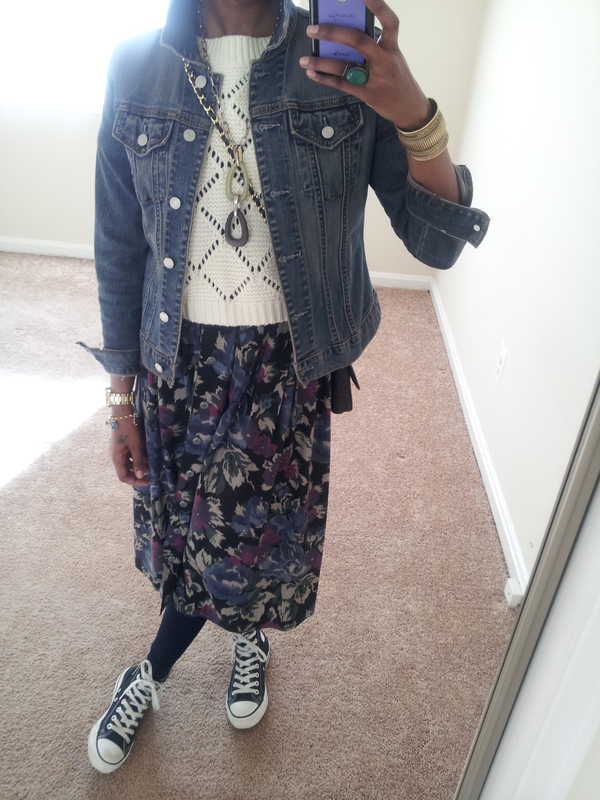 🙂 Thrifted items: Gap jean jacket $5.99 and skirt $3.99. Tell us how you hide your food baby during the holiday season of feasting that kicks off with Thanksgiving and lasts through New Year’s Day! Categories: Outfit of the Day, Styling | Tags: holidays, outfit of the day, sweaters, thanksgiving, what reese wore, what ricks wore | Permalink.